Why should I contact Cost Management Consultants? Because you have everything to gain and nothing to lose! If we don’t find savings for you after the audit, you owe us nothing. If we do find that you are paying more than you should, as is usually the case, we are compensated from the funds that we recover only. Our compensation comes from this "recouped income" and is not an additional expense. I've already had an audit done by someone. Why should I have another? Many times, even after other auditors have done work, we've come in and found very substantial additional savings. For example, we obtained tens of thousands in refunds for a client that had just completed an audit. Another client, that had been audited twice, also received thousands in refunds! Why should I have to pay for something we can do ourselves? Well, you shouldn't pay for something you can do yourself. What steps have you taken so far to reduce your IT/telecom and utility costs? Some of our best clients tried to initiate their own savings first, but we found additional savings that they had no idea was possible. 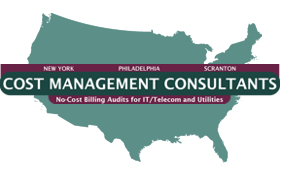 We saved one of our clients $80,000 even though they have a full telecommunications department and had been independently audited once before! Give us a try, you've got nothing to lose -- and only money to gain. How will I know that you've saved us any money? After reviewing your records we create a 'base period' profile. We then compare the profile with the actual savings after your company implements our recommendations. Our clients often comment that our savings comparison spreadsheets are very clear and easy to understand. We proudly serve the entire United States with a staff of Professional Engineers registered in all fifty states.